This is a great special occasion recipe for us…or a good Sunday splurge. Most recently we cooked it for Easter dinner and it just melts in your mouth when cooked to medium-rare. Compliment it with a glass of nice red wine and you feel like you are out at a Four-star restaurant! It does take some time to properly prep herbs though so if you are in a hurry this is probably not the recipe for you. If you have a few extra minutes, the effort is well worth it. The fresh parsley, Thyme & Garlic combined with the mustard and lemon juice just pair so nicely. We have substituted dried herbs in a pinch before but the quality and taste just wasn’t the same–also if you substitute dried herbs make sure you look up online a proper conversion rate as you don’t need nearly as much of dried herbs in a recipe as you do of fresh. 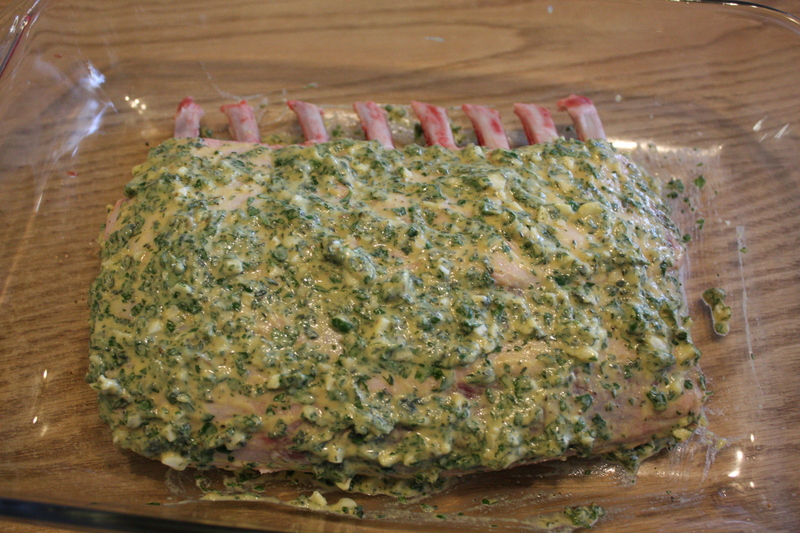 Take the rack of lamb and set on cutting board or platter you can use to take lamb out to the barbecue. 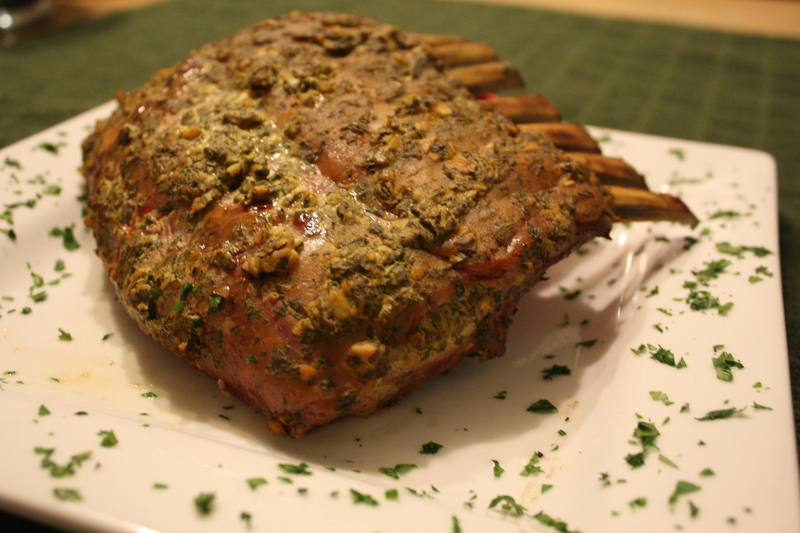 Lightly sprinkle both sides of the rack of lamb with salt and pepper. Set aside. Finely chop thyme & parsley. Mince the garlic. Then combine the mustard, thyme, parsley, lemon juice and garlic. Mix well. 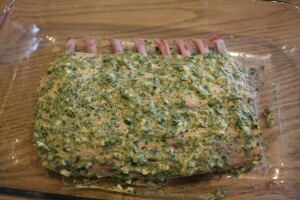 Rub mustard/herb mixture into the rack of lamb. Bring grill to Medium-High heat. Place rack of lamb on grill over indirect heat. Grill for 20 minutes and check temperature. Make sure it does not overcook. Grill until internal temperature registers 135-140 degrees if looking for rare to medium-rare. Remove from heat and tent with foil. USDA recommends eating when internal temperature is 145 degrees but lamb will continue cooking when removed from grill another 5-10 degrees. If you like your meat more medium well to well remove at 145 degrees. Let rest for 10 minutes. OPTIONAL: Serve with a side of balsamic vinegar mixed with mint jelly for a nice dipping sauce. The balsamic and the mint blend nicely to dip lightly in.